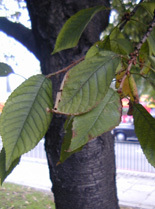 There are lots of cherry trees scattered about London and Britain generally; it is a very popular tree indeed, because it is quite small and makes a nice garden tree. It is often found it churchyards. However, most cherry trees that you see originate from Japan. This one, the bird cherry, is native to Britain, though very rare these days. It is called the bird cherry because birds like the fruit; they are edible to humans, but our refined palates find them a little bitter. During the middle ages when the Black Death was rife, it was thought that the bark from this tree had spiritual properties which could ward off the plague. Perhaps the reason why this tree is in decline is because its fruit does not taste as good as that of the wild cherry, and it does not bloom as beautifully as the Japanese cherry, and so it is caught somewhere in the middle. alternate; veins: opposite; oval with a point; about half the size of normal (Japanese) cherry trees..
flowers: April/May; white; pretty, but not elaborate. smooth and metallic with horizontal ridges. grows to about 20 metres sometimes more than one trunk; compressed. general: quite rare, especially in London, though there is also one in Linconln's Inn fields. is the second furthest along, to the end.